Pentagon officials told the Free Beacon the flight test of the new road-mobile DF-41 missile took place Tuesday with two multiple, independently targetable reentry vehicles, or MIRVs, that were monitored in flight by U.S. military satellites and other regional sensors. Officials did not say where the test took place. Past DF-41 launches were carried out from the Wuzhai Missile and Space Test Center in central China. The latest flight test followed an earlier, rail-based canister ejection test of a DF-41 on Dec. 5. U.S. Strategic Command commander Adm. Cecil Haney said Jan. 22 that China’s multiple warhead missiles are part of a significant investment in both nuclear and conventional forces. "China is re-engineering its long-range ballistic missiles to carry multiple nuclear warheads," Haney said in a speech. The flight test came around the same time that a high-ranking Chinese general made an unusual visit to a disputed South China Sea island. Also, the missile test occurred three days before Defense Secretary Ash Carter visited the aircraft carrier USS Stennis as it sailed in the South China Sea. Pentagon officials said the visit to Fiery Cross Reef in the Spratly Islands by Gen. Fan Changlong was timed to the Carter visit to the region. Fan is vice chairman of the Central Military Commission, the most powerful military organ under the ruling Communist Party of China. The Pentagon has said China is covertly building military bases on disputed islands in the sea. Beijing has accused Washington of militarizing the sea by deploying warships and bolstering regional alliances. Disclosure of the DF-41 test follows a newsletter report last month that stated China is nearing deployment of the new ICBM. Kanwa Asian Defense reported last month that the new ICBM is in the final testing phase, and its expected deployment area will be near Xinyang in Henan province, in central China. From that location, the missile would be capable of striking the United States in around 30 minutes, either through a polar trajectory or over the Pacific. An earlier flight test of the DF-41, also with two dummy warheads, was carried out Aug. 6. The new missile poses a significant strategic threat because it is larger than other road-mobile ICBMs and the new JL-2 submarine-launched ballistic missile. The DF-41 is assessed by U.S. intelligence agencies to be powerful enough to deliver between six and 10 warheads up to 7,456 miles—far enough to reach every corner of the United States from launch areas in eastern China. Rick Fisher, a China military affairs analyst, said the latest launch is the seventh reported flight test of the DF-41, an indication the ICBM will soon be deployed with the newly-renamed PLA Rocket Forces. "As with previous MIRV tests, the PLA has used a small number of reentry vehicles to mask the real capability of the DF-41, which is estimated to be able to loft up to 10 warheads," said Fisher, senior fellow at the International Assessment and Strategy Center. The congressional U.S.-China Economic and Security Review Commission stated in its most recent annual report that China is developing maneuvering re-entry vehicles, or MARVs, in addition to multi-warhead missiles. "Because MARV-equipped warheads are capable of performing preplanned flight maneuvers during reentry, they are more difficult to intercept and better able to penetrate adversary missile defenses," the report said. Fisher said he expects China to sharply increase the number of warheads in its arsenal as a result of the shift to multiple-warhead missiles. China also has begun retrofitting older, single warhead DF-5 ICBMs with MIRVs, according to defense officials, who said the uploading was detected over the past several months. China is currently engaged in a large-scale buildup of nuclear forces and missile delivery systems that include new missiles and a hypersonic glide vehicle—a weapon that can maneuver to avoid missile defenses in delivering nuclear or conventional warheads. "There will initially be two types of DF-41s, a road and rail mobile version, indicating the PLA could be fielding several brigades of this ICBM," Fisher said. "In addition, there may be a new MIRV equipped version of the older DF-31, called the DF-31B." China also is expected to add multiple warheads to its new submarine-launched missile, called JL-2C or JL-3. "The DF-41 program appears to be in the advanced stage of research and development," said Mark Stokes, a former Pentagon specialist on the Chinese military. Stokes said the DF-41 appears to be a modified variant of the post-boost stage of the DF-5B ICBM that has been placed on a larger solid rocket motor. If the design is certified by the manufacturer, the DF-41 could be deployed within five years. "The first unit equipped with the DF-41 could be expected to have at least six launchers in its inventory," Stokes said. Fisher said it is evident the Obama administration policy of reducing nuclear weapons "is not going to be reciprocated by China, Russia, North Korea or Iran." "But what is much worse is that China and Russia are increasingly coordinating their military forces against the Untied States and that China's program of enabling North Korea and Iran to become nuclear missile powers is nearing completion," he said. To deter nuclear attack from hostile powers, the United States should rapidly expand its warhead stockpile by at least 1,000 warheads, Fisher said. "In addition, the U.S. must quickly reintroduce tactical nuclear forces back to the Navy and Army to enable more assured deterrence of North Korea and Iran," he said. A Pentagon spokesman did not respond to emails and telephone calls seeking comment. Asked last month if China would soon deploy the DF-41, Chinese Defense Ministry spokesman Sr. Col. Yang Yujun told reporters in Beijing, "I don’t have any information to release here." In a Dec. 31 response to the Dec. 5 rail-mobile ejection test of the DF-41, Yang said "Scientific tests within the Chinese territory are conducted according to plan." 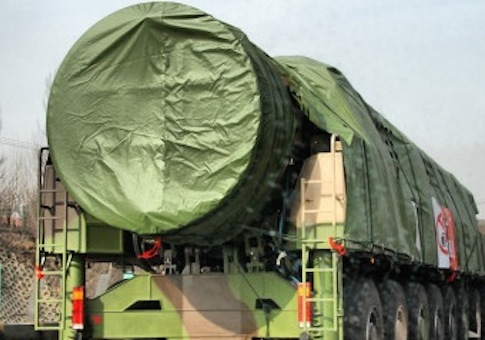 A Chinese regional government website first disclosed the existence of the DF-41 on Aug. 1, 2014. The Shaanxi Province Environmental Monitoring Center official website reported the "China Aerospace Science and Technology Corporation 4th Institute 43 Study Department DF-41 missiles" office had been closed. The study office was said to be involved in developing composite materials used in the missiles. The office is in charge of building solid fuel rocket engine casings, missile canister launchers, and nozzles made from high-strength composite material. The closure was said to be an indication that DF-41 development had advanced considerably. The posting was removed days later, after Western news reports mentioned the post.